On Burnow Island, Fugitoid is struggling to undo Stockman’s sabotage of the slumbering Utroms. Their pods have drained of ooze and unless the power is restored and the ooze pumps are brought back online to refill the pods, they’ll all die. Fugitoid locks Stockman in a storage room and goes to the only one he can for help: General Krang. As Fugitoid explains the situation to Krang, Stockman escapes from the storage room. Fugitoid informs Krang that the power has to be turned on from the electrical box outside the facility, but with the hurricane blowing through it would be too dangerous for anyone to risk it. For the good of his people, Krang volunteers to go. The past. Many years ago in Dimension X. General Krang arrives on Utrominon and is greeted by Councilor Drexl. Drexl informs him that the old Ruling Council was “replaced” and that the Triceraton rebel leader, Zog, has been captured and is awaiting execution. Krang forgoes the festivities of his victory parade, and a meeting with his father (Emperor Quanin), and heads straight to the city prison. At the prison, in addition to Zog, he finds all the previous members of the Ruling Council locked up as “political prisoners”. Krang has a talk with ex-Councilor Lorqa. While the rest of the Utroms enjoy the parade, Krang barges into the Imperial palace to see Quanin. He tells Quanin that Lorqa informed him all about their depleted resources, their dying homeworld and how the parades and festivities have been nothing more than a distraction to keep the populace ignorant. Quanin tries to offer Krang a seat on the new Ruling Council, but he refuses, saying that his place is leading the Empire’s armies until they’ve won the war and the Utroms are at peace. Quanin explains that the Utroms can NEVER be at peace; that they must ALWAYS be at war in order to give their race purpose. Suddenly, Drexl bursts in with news that Zog has escaped from prison. 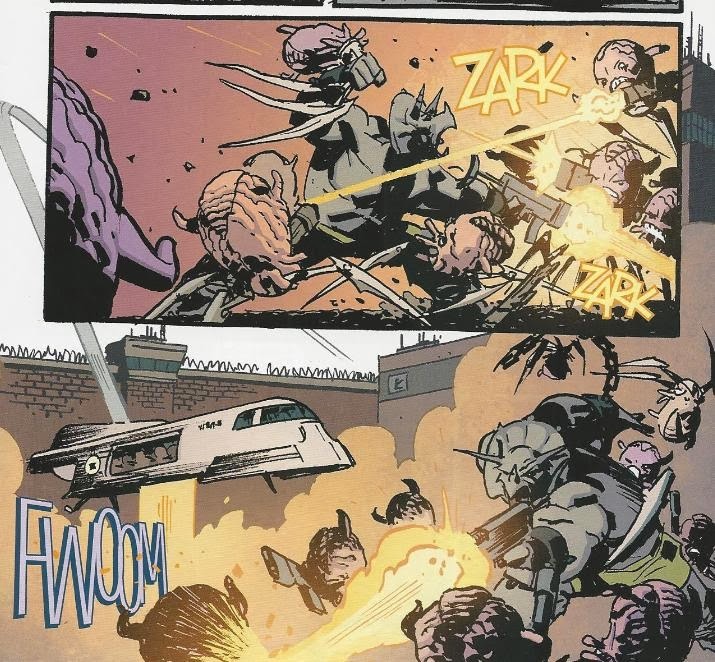 Krang, Quanin and several Utrom soldiers arrive in an airship at the prison to try and stop Zog. 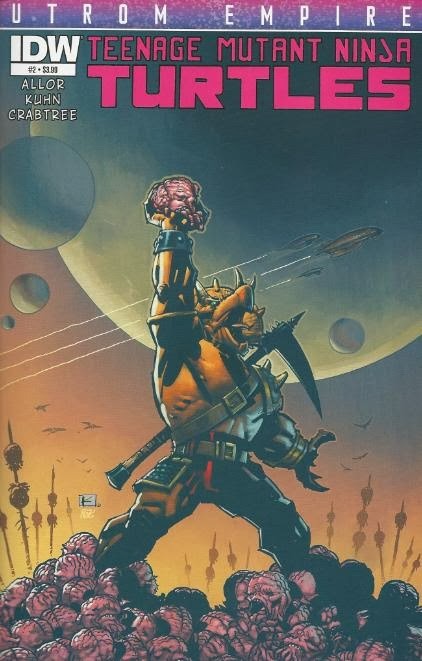 Zog takes Krang hostage and puts a gun to his head, demanding safe passage on the airship. The present. Outside, Krang fends off the hurricane and reaches the electrical box. Over the radio, Fugitoid tells him which wires to reconnect, but before he can warn him about an electrical backlash his connection gets cut off. Inside, Stockman and his Flyborg have taken down the Rock Soldier guards. Fugitoid begs Stockman to work with him to stop the Technodrome and save the Earth, but without killing the Utroms. 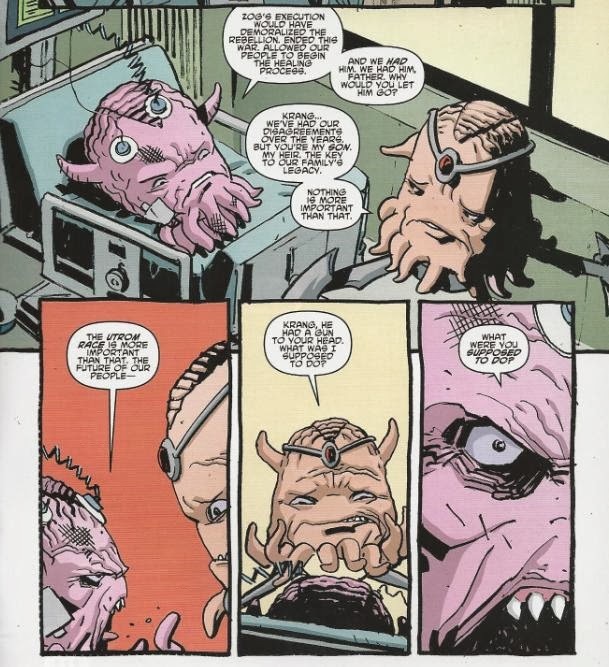 Stockman reveals that he never had any intentions of allying himself with the Fugitoid to begin with; he intended to frame him for the murder of the Utroms and carry on sabotaging Krang from beneath his nose until he could steal all the alien secrets for himself. The Flyborg attacks the Fugitoid, but he manages to get one of the guns from an unconscious Rock Soldier. Fugitoid blasts the Flyborg, wallops Stockman and runs away on his own. At the farm in Northampton, Donatello goes over the Fugitoid’s notebook with Raph and Mike. Don explains that the notebook contains full schematics of the Technodrome, INCLUDING a self-destruct mechanism. Raph asks how they’re going to GET to Burnow Island to sabotage the Technodrome. Don says he hasn’t figured that out yet. On Burnow Island, Krang connects the wires and the surge of electricity sends him flying and crashing against some rocks. The past. At the prison, Krang tells the soldiers to shoot him and Zog, because if Zog escapes it will encourage the rebellion and extend the war. Quanin tells his soldiers to stand down. Zog escapes in the airship, and once again warning Krang about the path of self-destruction Quanin is leading the Utroms down, gives him another chance to help end the war. Krang refuses and Zog chucks him out of the ship. Sometime later, Krang recovers at a hospital. Quanin comes to visit him and Krang asks his father why he didn’t order the soldiers to open fire. Quanin says that he couldn’t allow his only heir to be executed. Krang becomes furious, telling Quanin that one life was not worth the possible destruction of the entire Utrom race. The present. Krang stumbles to his feet, but the winds of the hurricane knock him over a ledge and he crashes down onto the beach. *This story is continued from TMNT: Utrom Empire #1. The story concludes in TMNT: Utrom Empire #3. *This issue takes place between TMNT (IDW) #30 and TMNT (IDW) #31. 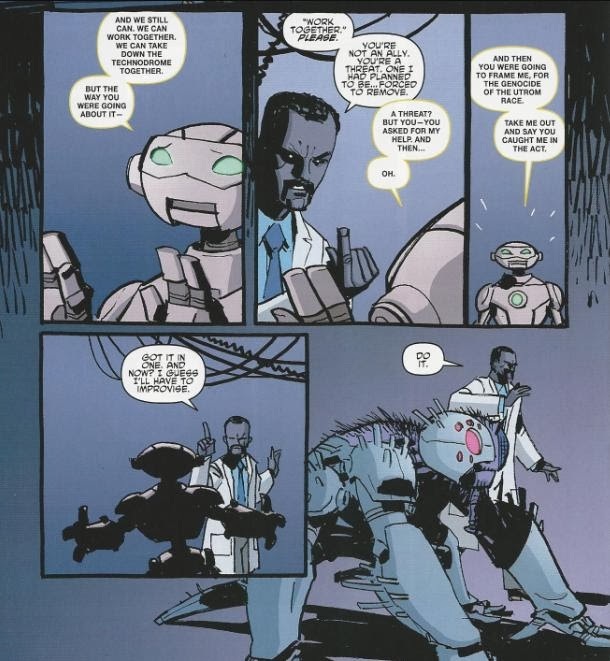 *Stockman created the Flyborgs in TMNT Villain Micro-Series #2: Baxter. *This issue was originally published with 2 variant covers: Regular Cover by Kuhn, and Subscription Cover by Nick Pitarra, “Greg” and “Fake Petre”. Quanin is clearly not the character I had him pegged as when his name and brief back story were dropped some while ago. He was built up as this ruthless, blood-thirsty monster. Even his appearance in the Krang Villain Micro set him up as this nasty, cold-hearted conqueror. In this issue, though, he seems downright… considerate. I get the feeling that in his old age, Quanin's attitude has changed. He doesn’t have to go out and conquer planets himself anymore; he can delegate that sort of thing. So he’s grown soft in body and nerve. Which is funny, considering that’s exactly what he was shown brow-beating Krang over in the Villain Micro; he loathed his son for being soft. Heck, part of Quanin’s whole scheme involves lulling the masses of Utrominon into complacency with trivial distractions, making his entire race soft and weak. Clearly, he’s changed, though Shadows of the crueler Quanin are still there, as he explains to Krang that he can never let the war end because then the Utroms would lose all sense of purpose. What good is an Empire if it stops expanding, after all? So he keeps the war going at the cost of Utrom lives and toward the inevitable destruction of his very race. And all of a sudden Krang gets a virtuous side, willing to give his own life for his people (in the past and in the present). There’s this great sequence in this story where Krang just gets through telling his father how badly he wants the war to end and to give his people peace, but a few pages later, when Zog offers him the chance to cooperate with the rebels and overthrow Quanin and end the war… he refuses. You get a really good feel for Krang in this story. He’s not a warmonger because he sincerely wants peace, but it has to be peace through Utrom victory, not conditional compromise with the enemy. His racial pride forever keeps his goal out of reach, whether it be refusing to barter a treaty with the rebels or refusing to coexist with humanity on Earth (instead going with the whole Technodrome thing to terraform the planet and make it his own). Paul Allor is really doing wonders with these characters, none of whom are turning out to be anything like I was anticipating them to be. I think my one complaint about the script was the flimsy excuse for sending Krang out to repair the electrical box. I get that Krang needed to be the one to go in order to establish that symmetry with the past narrative; to show how willing he is to lay down his life for his race. But the excuse was that Krang was the only one who could withstand the punishment of the hurricane outside. Couldn’t a Rock Soldier have endured the wind and rain just as well? Heck, a Rock Soldier probably would have been better suited to withstanding the electrical surge since, you know. Made of rock. But hey, I’m just picking nits. Utrom Empire is turning out to be one of the most fascinating character deconstructions IDW has published so far, really building these established cast members into something three dimensional. Grade: B(as in, "By God, Stockman's has a lot of lower body strength. Just look at the way he kicked in that door." I read it that Honeycut was gonna suggest someone sensible, or even himself to do the job; but Krang shut him off saying that he'd do it, rather then finishing Honeycut's sentence. This is in my top 5 for the IDW covers.